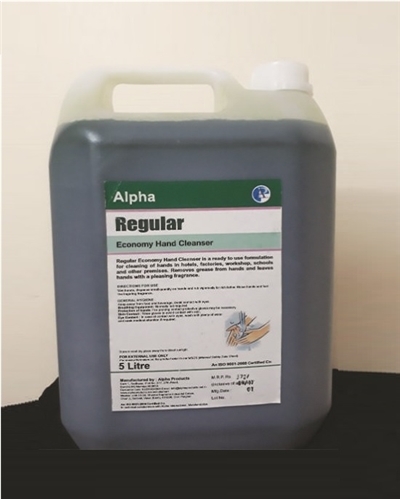 REGULAR Economy Hand Cleanser is a ready to use formulation for cleaning of hands in hotels, factories, workshop, schools and other premises. Removes grease from hands and leaves hands with a pleasing fragrance. Wet hands, dispense small quantity on hands and rub vigorously for rich lather. Rinse hands and feel the lingering fragrance. Keep away from food and beverage. Avoid contact with eyes. Protection of hands: For prolong contact protective gloves may be necessary. Skin Contact: Wear gloves to avoid contact with skin. Eye Contact: In case of contact with eyes, wash with plenty of water and seek medical attention if required. Store in cool dry place away from direct sunlight.